I'm so excited to share what I deem to be one of the best kept secrets in town. I just so happened to be walking back to my car after lunch with a friend when I noticed this quaint storefront in Old Town Goleta called Santa Barbara Gift Baskets. 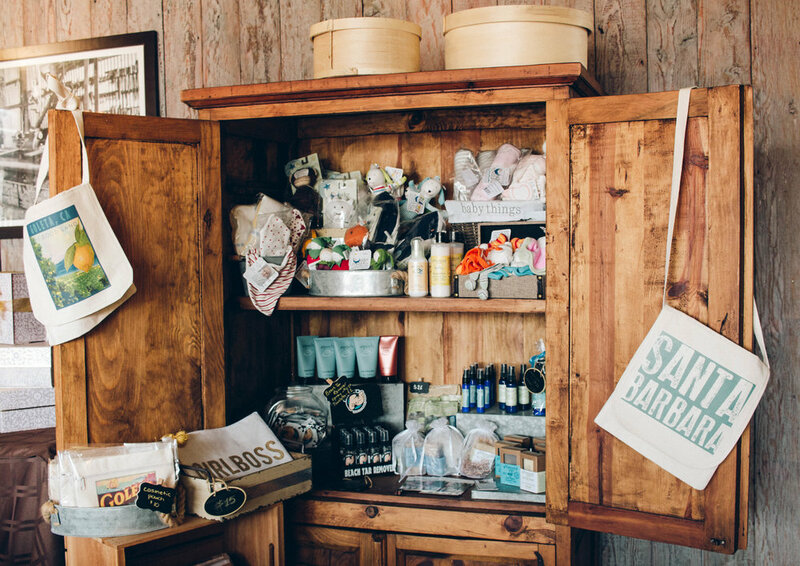 In case you didn't already infer from the name, SB Gift Baskets sells pre-made gift baskets and gift boxes filled with local goodies, but also offers the option to completely customize your own! 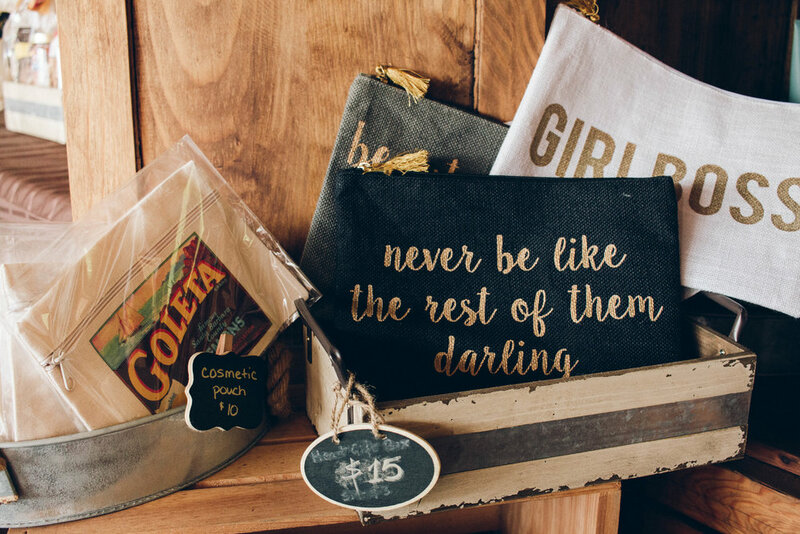 That means you get to specially handpick every item that goes into one of their adorably rustic gift boxes with your friend / family member / beau in mind. This little shop had so many cute sections and noteworthy details that I couldn't help but take a plethora of photos! There have been so many times when I've failed to think of Santa Barbara gift ideas other than wine when I've tried to shop for friends and family back home. I was pleasantly surprised to find a huge variety of goods to choose from, which meant I could go gift shopping for almost anyone - baby products, wine and beer, skincare, bridal party accessories, gourmet food, pet products - you name it, they have it (and best of all, most are from local businesses in the Central Coast or in California). I attempted to ask Anne, the owner, to choose a favorite product but soon realized that that was probably an impossible question to ask someone who's so passionate about every item she sells at her shop. We bonded over our mutual interest in supporting local businesses, which I later found out was partly the reason why she created Santa Barbara Gift Baskets. If you click through the slideshow below, you'll see a few of Anne's favorite finds that we talked about during my visit (make sure to click the image if you want to visit their website for more information). This was one of the owner, Anne's, favorite gift baskets featuring many Santa Barbara classics. Click the photo to check out the rest of her cute sets! Per Anne's recommendation, I tried the Sea Salt and Olive Oil flavor, and I was surprised at how much I was able to taste the olive oil in each bite. Apparently it is notoriously difficult to find locally produced skincare products, but I'm glad Anne was able to find The Grapeseed Company, which has a fascinating backstory. After embarking on a 2 year sailing adventure, moving to Santa Barbara, and experimenting with the uses of grapeseeds, Kristin launched her "first vinotherapy line upcycled from the byproduct of the California wine industry." 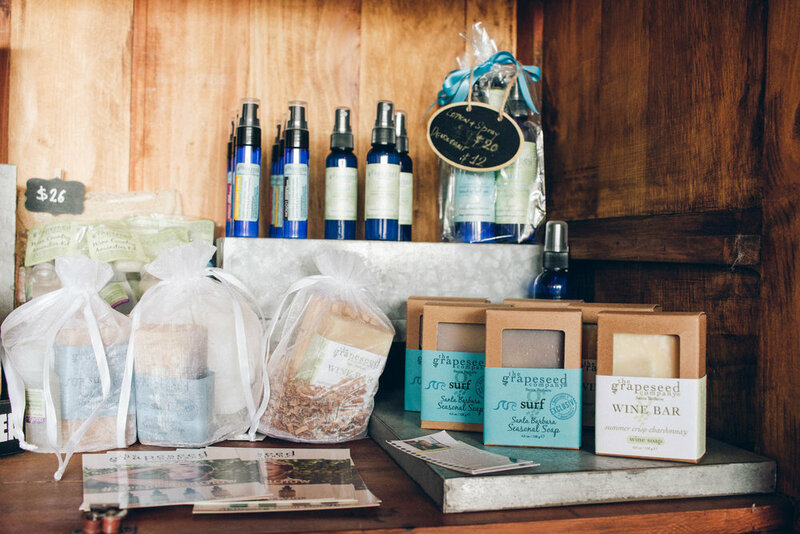 The Grapeseed Company now sells "over 100 vinotherapy skin, hair, bath & body products utilizing fresh, local ingredients." How amazing is that? Originally known for its all-natural and handcrafted Santa Barbara pickles, Pacific Pickle Works is also renowned for its award-winning Bloody Mary Elixir, made from scratch with all-natural ingredients... and with their homemade Worcestershire Sauce, of course! After taking home a Cupcake Wars win, owner Alison Riede launched the Sugar Cat Studio which sells a line of gourmet, gluten-free cupcake mixes known for its unique combinations of beer, wine, and other spirits. "Oil Slick is a handmade formula designed to efficiently and effectively remove the beach tar off skin, shoes, sandals, and even surfboards! Oil Slick is completely non toxic, eco-friendly, smells great and is made here locally in the Santa Barbara county area." Another one of Anne's super cute gift boxes filled with the perfect goodies for your girlfriend or BFF! 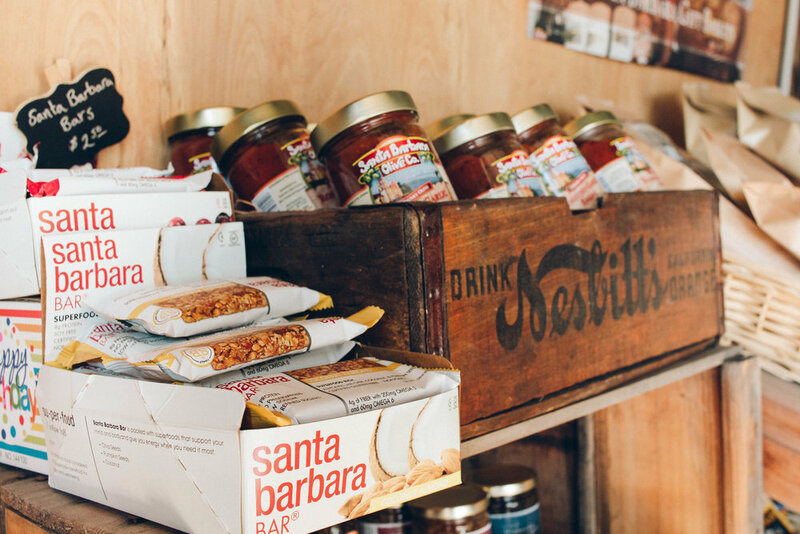 Located in the Santa Ynez Valley, Michele's Tesora sells gourmet candy made with all-natural, organic ingredients. After trying a sample, I have to say it tastes like a healthier (yet equally as savory) version of Reese's Pieces balanced with a subtle amount of crunchiness from crisped rice. Basically... YUM. It doesn't get any more vanilla than Jilli Vanilli, which uses a locally distilled and pure artisanal alcohol for their vanilla products! I was already hooked after one whiff of their deliciously aromatic Vanilla Soy Candle. As I mentioned earlier, I took so many photos because the entire shop was so picturesque. If you keep scrolling down, you'll see some more honorable mentions and photos of products that were too good not to include! I had an amazing time getting to know Anne and hearing the beautiful stories behind many of these products. If you are ever in Goleta and haven't visited before, make sure to come during lunch and buy a glass of wine or beer while you shop! They also host monthly tasting events and design-your-own gift basket classes, which I'll definitely be signing up for when my girlfriends from LA come to visit. For more information, you can visit their website here: http://www.santabarbaragiftbaskets.com. 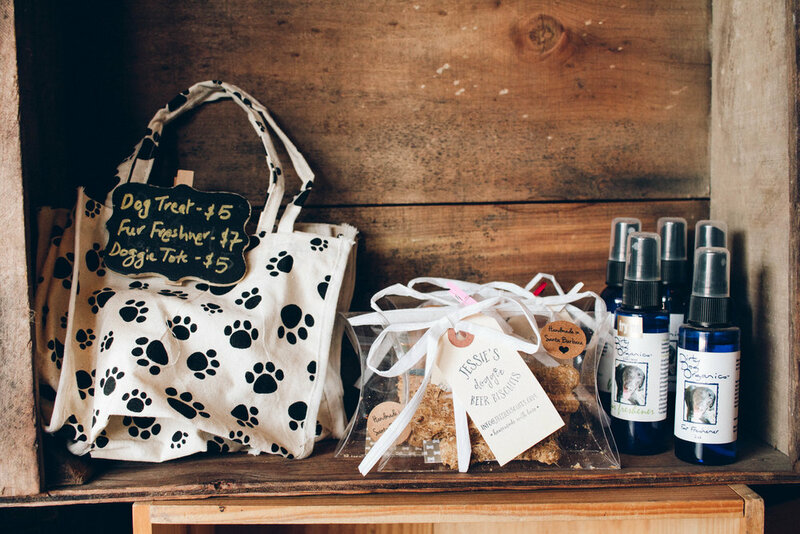 Did you see a local goodie that piqued your interest?